Müller helped Bayern win the Champions League in 2013 at Wembley. 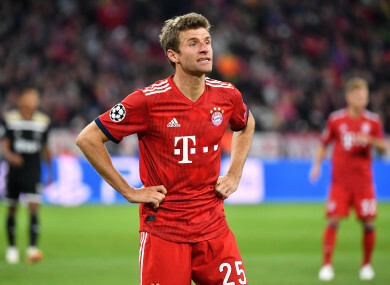 LIVERPOOL HAVE BEEN handed a big boost ahead of their Champions League knockout stage tie against Bayern Munich, with star forward Thomas Müller set to miss both legs via suspension. The World Cup winner was sent off against Ajax during his side’s final group stage game in December and handed a two-game suspension. The Bundesliga champions attempted to appeal the suspension, seeking to have it reduced to just one game for Müller’s high-flying challenge on Nicolás Tagliafico. However Uefa upheld the two-game penalty on Monday, with the 29-year-old set to play no part in the knockout stage ties at Anfield and the Allianz Arena. Jurgen Klopp’s men made it all the way to the final last season, losing 3-1 against Real Madrid in Kiev. The Reds are trying to balance battles on the European and domestic fronts this season, with the Merseysiders sitting atop the Premier League seeking a first league title in 29 years. Bayern travel to take on Liverpool at Anfield on Tuesday 19 February, ten days after the Reds face Bournemouth, with the second leg set for three weeks later on 13 March in Munich. Email “Liverpool handed boost as Thomas Müller ruled out of Champions League knockout tie”. Feedback on “Liverpool handed boost as Thomas Müller ruled out of Champions League knockout tie”.